Probably the most frequent procedure performed is one called a Post or an Arthroplasty. In this case a small piece of bone is removed from the joint to straighten the toe. 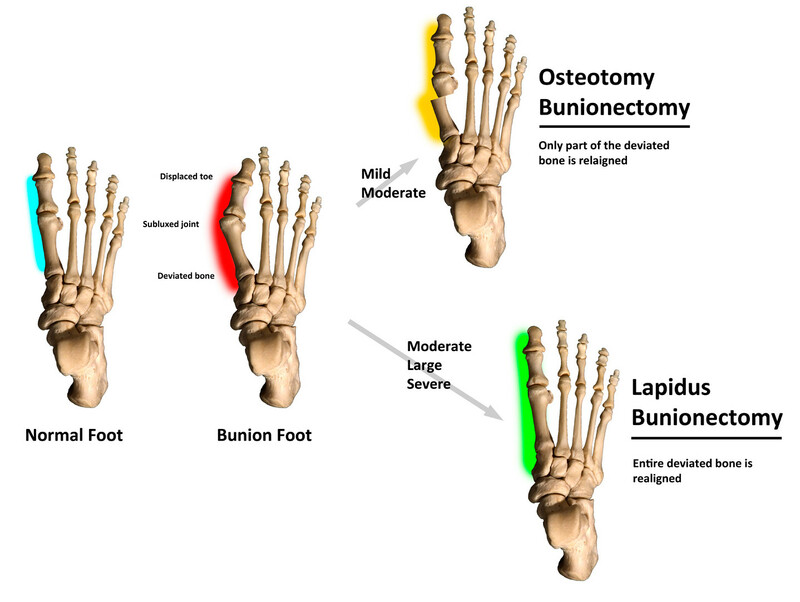 The toe is shortened somewhat, but there is still motion within the toe post-operatively. In other cases, an Arthrodesis is performed. This involves fusing the abnormally-contracted joint. The Taylor procedure fuses only the first joint in the toe, whereas the Lambrinudi procedure fuses both joints within the toe. Toes which have had these procedures are usually perfectly straight, but they take longer to heal and don't bend afterwards. A Hibbs procedure is a transfer of the toe's long extensor tendon to the top of the metatarsal bone. The idea of this procedure is to remove the deforming cause of the hammertoes (in this case, extensor substitution), but to preserve the tendon's function in dorsifexing the foot by reattaching it to the metatarsals. Fortunately, the Gotch (or Gotch and Kreuz) procedure--the removal of the base of the toe where it attaches to the foot, is done less frequently than in years past. The problem with this procedure is that it doesn't address the problem at the level of the deformity, and it causes the toe to become destabilized, often resulting in hammertoes a toe that has contracted up and back onto the top of the foot. You can even have an Implant Arthroplasty procedure, where a small, false joint is inserted into place. There are several other procedures, as well. mariellaodens is using Hatena Blog. Would you like to try it too?